A new partnership between IVECO and Boral has resulted in the development of the Forward Moving Aggregate Spreader (FMAS) – a new road surfacing truck designed to revolutionise the method of spray seal road construction in Australia. Up until now, the process of spray seal road construction in the country involved road crews working with reversing trucks that applied the aggregate through an elevated tipper body, increasing the safety risks to workers. 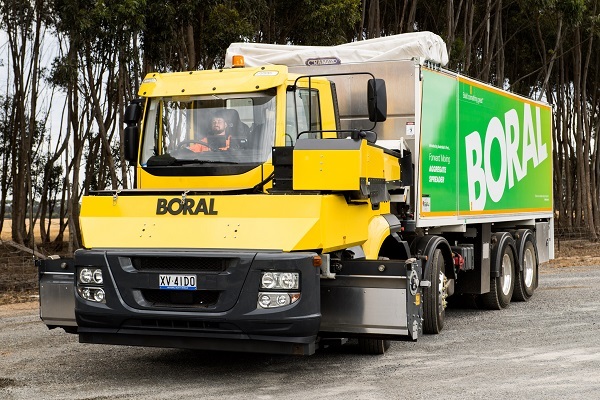 Boral’s new road surfacing truck, which is based on IVECO’s Stralis AD 8×4 platform, improves safety and maximises visibility by dispersing aggregate from the front of the truck via a conveyor belt and spreader box. Stuart Partridge, Boral’s National Asset Manager – Asphalt, said the FMAS was designed to address VicRoads concerns about worker safety following a serious accident involving a VicRoads worker some years ago. “Rollover accidents, blind spots and high reversing tippers that can be at risk of interfering with power lines or overhanging trees are just some of the problems associated with the current range of spreaders. Boral Australia CEO Joe Goss said the new Boral FMAS was a demonstration of the company’s unwavering commitment to ensure the safety of all employees and the community in general. IVECO Australia Managing Director, Bruce Healy, said the company was ‘extremely excited’ to have been involved in the development of the FMAS. “Boral has shown innovation and forethought in researching and ultimately developing this vehicle in line with the new industry safety standards in Australia,” Mr Healy said.